In April 2007, Margaret McAustin was elected Pasadena City Council Member for District 2, home to some of the City’s most venerable Neighborhoods and Historic Landmark Districts, including North Pasadena Heights, Historic Highlands, Bungalow Heaven, Crawford’s Vista and Brigden Ranch. 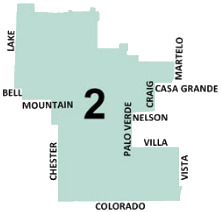 District 2 also includes the many businesses in the commercial corridors along Washington Boulevard, Lake Avenue and Allen Avenue, serving the needs of the residents of north‐central Pasadena. As a Council Member, Margaret serves as Chair of the Municipal Services Committee. Margaret is committed to advancing the City as an environmental leader while providing affordable power and water for our residents for years to come through solid planning and infrastructure investment. 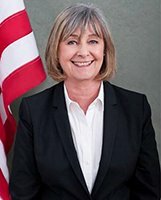 Margaret also serves on the Public Safety Committee, the Finance Committee and as the Pasadena representative to the Foothill Transit Governing Board. Curb Numbers? No Permit, No Address Painting! Every year, the Tournament of Roses gives each City Council Member tickets to distribute to their Council District. In District 2, the preferred method is by lottery. If you live in District 2 and would like to enter, here are the details.